One of the best features of beer bread is that it requires no kneading or long rising times. 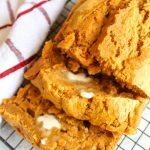 Pair them together to get this easy pumpkin beer bread recipe. Grease a large loaf pan well. Combine flour, pumpkin pie spice, baking powder, salt, and brown sugar in a large bowl until thoroughly mixed. Add pumpkin puree and beer, stir until just combined. Bake for 55-60 minutes, until the top, is crusty and golden brown. Remove from oven and let rest for 5 to minutes before cutting into it.